The taco’s regionality complicates the classification of “traditional.” From the indigenous preparations of southern Mexico to borderland specialties, traditional is a generic label on a big box. 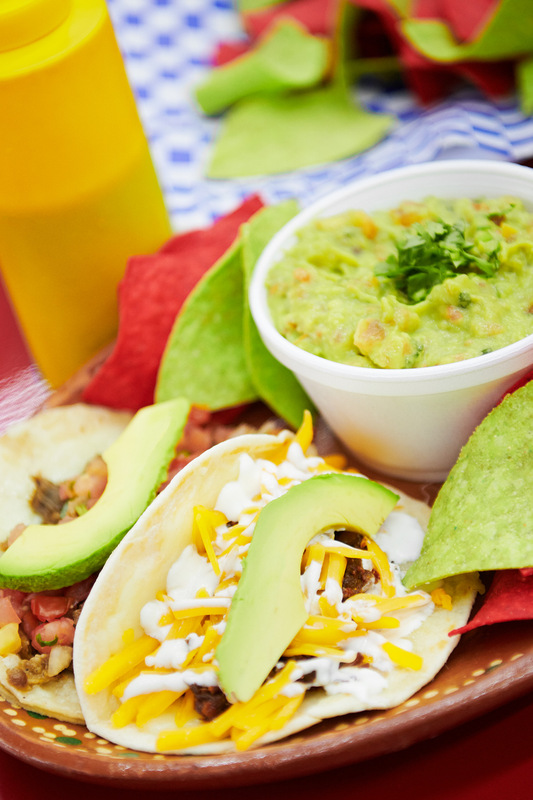 The category includes more than grilled beef, tacos al pastor, and what are popularly referred to as street tacos. Tacos utilizing flour tortillas, the inclusion of cheese, and old-fashioned fried tacos—whether from a corner of Mexico or from north of the Rio Grande—also fit into the space. So instead, we’re going with “classic” for tacos that represent time-honored preparations and designations, whether readily available on this side of the Rio Grande or specific to a Mexican town, state, or region. 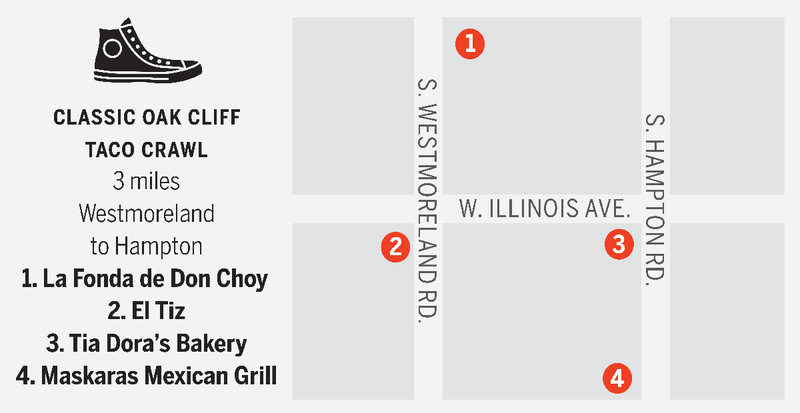 With bits of a charred exterior and a juicy interior, the chopped beef suadero is already a prime selection at this Fitzhugh Avenue taqueria. Tack on feathery cubed potatoes and tangy nopales strips, and you’ve got a stellar example of the array of garnishes available at street stalls across Mexico. Holy Guacamole: This taco from Maskaras Mexican Grill in Oak Cliff is just one that’ll take you to church. In the lingo of Mexican food, “campechano” means “mixed.” The combination can be of different seafoods, meat, or both. At Trompo, the campechano is a one-two protein punch of paprika-massaged Monterrey-style pork al pastor and chopped bistec strewn across a bed of melted white cheese on a gossamer Sonoran-style flour tortilla. Although the campechano is listed under the quesadilla section of the menu, we won’t quibble. Quesadillas are little more than tacos with melted cheese. The crispy taco doesn’t deserve its maligned reputation. Fried to order, as it is at Gonzalez Restaurant on Jefferson Boulevard, the snappy tortilla carries the memory of its hot bath with none of the stale or greasy characteristics of its prefabricated, supermarket counterpart. It’s a marvel of history filled with fluffy ground beef, fresh green lettuce, and radiant cheese. The gamy tinge that sideswipes your tongue on the first bite of this stewed goat taco eases as you continue to relish it. And continue you will. A rich, almost candylike flavor comes to prominence compelling you to munch more. 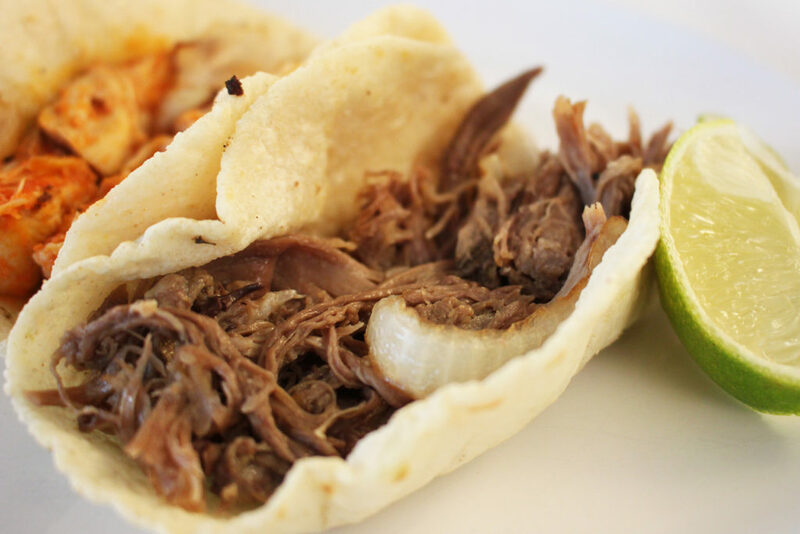 Thankfully, there is enough birria to make a second taco with the additional, supporting tortilla provided. Yes, bone-in chopped ribs are tricky little things to eat in taco form. But draped in a salsa verde shawl that sizzles as it touches the lips, it is worth the trouble. But only if you’re carrying cash. This taqueria inside Supermercado Monterrey #11 doesn’t accept plastic. Served by the pound in chafing dishes, the smoky, prickly lamb cousin of Texas barbecue is this Lake June restaurant’s specialty. (The English word “barbecue” is derived from the Spanish “barbacoa.”) Lift the shimmering lid and fork some of the meat into a tortilla for the finest in customizable tacos. Stick to tradition and visit the main location and its Maple Avenue satellite on Sundays; that’s when you’ll get the best barbacoa. El Tiz, formerly El Tizoncito, has several outstanding tacos, all of which signal the taqueria’s Mexico City origins. There’s the choriqueso, a velveteen amalgamation of chorizo and cheese, and the chuleta con queso, a pile of diced pork chop covered in a white blanket of Monterey Jack. And then there is the taco al pastor. Slices of carmine-colored pork from the spinning vertical rotisserie are haphazardly stacked on doubled-up yellow corn tortillas. Scarf it down before the whiffs of earthy spice dissipate. The puffy taco is not on the menu at Resident Taqueria, but it should be. The shimmering, seemingly weightless fried corn masa parcel brimming with the filling of your choosing—go for the beef picadillo studded with olives, whole cherry tomatoes, and garlic slivers—is not just one of the best tacos in Dallas. It’s one of the best puffy tacos in Texas. It’s impossible to not come away happy from Taco Stop, Emilia Flores’ walk-up taqueria in the Design District. There’s the sense of fellowship, from the poster explaining the owner’s stance on plastic straws to the Leave One-Take One winter-coat donation rack set up in the parking lot. There’s the taco selection too. And the first to reach for is the picadillo, a juicy, colorful ground beef filling in a fragrant Araiza Tortilla Factory corn tortilla. It’s enough to restore your faith in humanity.